Fish taco recipe that is quick and easy...with a healthy twist from The Dinner Plan Man. Toss cabbage, carrots, and cilantro in a large bowl. In a small bowl, combine all other ingredients to create dressing for slaw, taste for preferred seasoning. Pour dressing over vegetables and mix for 1 minute and allow to set in refrigerator for 30 minutes. Rub flounder fillets with Chipotle Lime Rub, use more or less depending on desired spiciness. Lightly brush both sides of fillets with Grapeseed Oil. Preheat grill or saute pan to high heat and lightly oil. Grill/cook fish on one side for 2-3 minutes, then flip and cook for an additional 2-3 minutes, or until fish is cooked through. 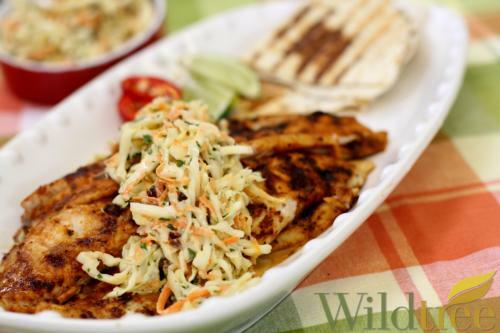 Serve with warmed tortillas and cranberry horseradish slaw to top off this fish taco recipe. Heat 1 tablespoon Grapeseed Oil in a skillet over medium heat. Add the onion, bell pepper, and corn; cook until tender. Add the beans; cook until heated through. Add the rice and toss to combine; season with salt and pepper if desired. Remove from heat; cover to keep warm. In a separate nonstick skillet heat the remaining tablespoon of Grapeseed Oil over medium high heat. Rub the Carne Asada Seasoning all over the fish. Sauté on both sides until completely cooked through. Divide rice mixture and fish among bowls. 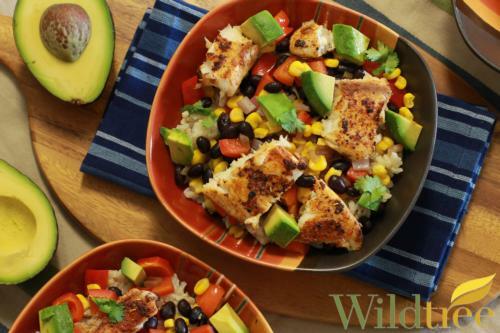 Serve with diced avocado and cilantro if desired for this fish taco recipe.